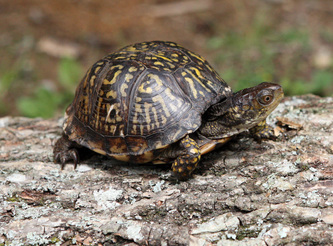 The Eastern Box Turtle (Terrapene Carolina) is a small to medium sized terrestrial turtle. They typically range from 4 to 6 inches, but have been known to reach nearly 8 inches in length. 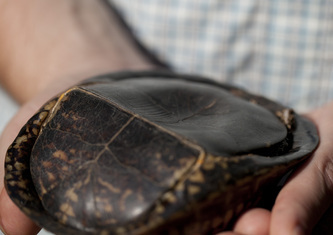 The shell, or carapace, is highly domed. 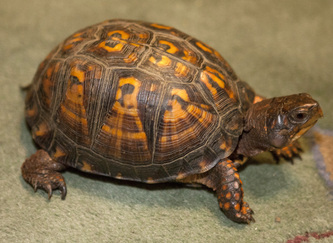 It is highly variable in color between individuals, but usually have a dark brown background with orange or yellow spots that seem to radiate from one spot on each scute (scale-like plates that make up the carapace). 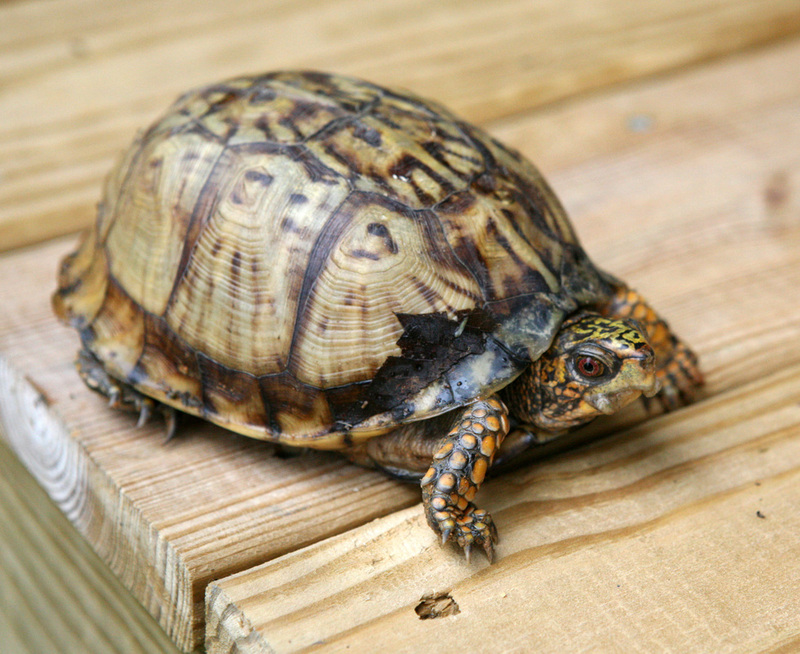 The plastron (the bottom of the shell) is also highly variable in color, but there are often broad areas of dark brown or black on a yellow or cream background on each scute. The front feet are only slightly webbed and have strong claws. The rear feet have been described as "elephantine" and are not webbed. The jaw has a prominent beak. 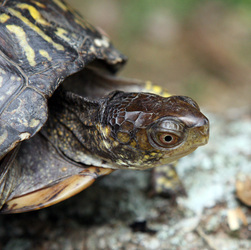 Males usually have red eyes and females have pale brown to orange eyes. The Eastern Box Turtle is known for the fact that it can pull its head, legs, and tail completely inside its shell and close it like a box; this seal can be so tight that it is waterproof. This is due to the fact that there are two hinges on the plastron. 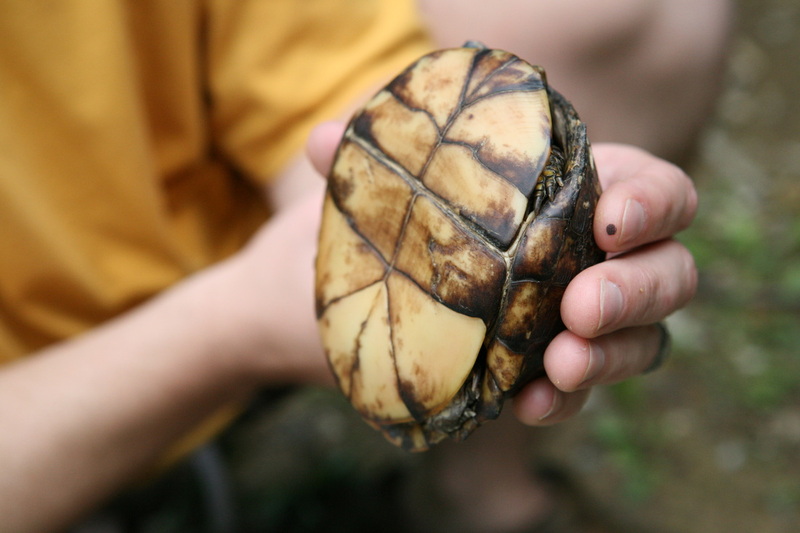 Females have a flat, or slightly concave plastron, while the males have a concave plastron with a broad dent to accommodate the female's carapace during mating. People often dislike these turtles because they like to sample from gardens and have been known to visit pet food dishes. They are omnivores and consume many kinds of plants (fruits and berries seem to be preferred), shelf fungi, mushrooms, insects, earthworms, slugs and snails, salamanders, and carrion (road-kill). They are commonly found in woodland habitats of nearly any type. They can be found around water and seem to be most common in wet areas near streams. They tend to be active early and late in the day and rest during the hotter portion of the day. They often hide, and hibernate, by digging themselves into the leaf litter just enough to bury their shell. Mating occurs during the spring and the females dig nests during the summer months where they lay 2 to 7 eggs that hatch in August and September. These turtles are long-lived, and their lifespan is measured in decades rather than years. This turtle is widespread throughout the eastern United States from southern New England, the mid-Atlantic, and the southern Great Lakes region southward to eastern Texas, the Gulf Coast, and Florida.